Vintage is a word that has generally come to mean anything not of the present day but, for jewelry purposes, it means anything older than 20 years but younger than 100 years. Earrings, as with any other jewelry types, are subject to the whims of fashion and have changed as much as any other down the ages. Here, we take a look at the different periods which have influenced earring design and manufacture. We’re stretching the definition of vintage, really, when we talk about true art nouveau, as the period had come to an end by about 1915. This really makes art nouveau pieces antique, rather than vintage, but the period has gone on to influence designers all the way through the last 100 years, and so is worthy of inclusion on that basis. Art nouveau was a time of floral, animal and general nature-based motifs. 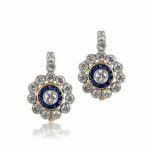 Gentle curves and flowing waves, leaves and flowers, butterflies and snakes were all fair game for designers of the time, and these all lend themselves beautifully to the creation of earrings. Often, though, these weren’t literal interpretations, but rather abstract designs which might not convey the appearance of a single element of nature, but a combination of several. 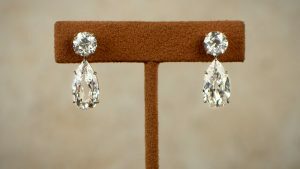 Most vintage earrings will be of the drop style, where there is two or 3 sections to the design, each dropping from the bottom of the one above it. This allows the incorporation of those multiple styles mentioned above. Femininity was definitely the order of the art nouveau day, and this is often enhanced by the deliberate selection of colored stones needed to create the floral effects of petals or leaves. The Edwardian era straddled the lines between art nouveau and art deco, maintaining some of the delicacy of art nouveau, whilst using a wide array of styles and incorporating other stones of different colors for the more adventurous lady of the time! Edwardian designers also made a brief return to a time when jewelry wasn’t all about diamonds, but when various materials might also used to make earrings and other pieces. Pearls were especially popular, and meant that a particular design could be just different enough not to fit into either art nouveau or art deco. As the softness and femininity of art nouveau gave way to the bold lines and sharp edges of art deco, so earring designers took on these new influence. All the curves and tranquility were gone and, in their place, were corners and aggression which reflected the booming industrialization of the world. 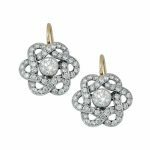 This was around the time that diamonds also experienced a surge in popularity, and the combination of the edges in the designs and the clarity of the diamonds meant designers pulled no punches in turning out earrings which demanded attention. It wasn’t all about diamonds though. 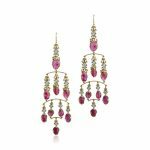 Earrings can all too often get forgotten, given that they are partly hidden by the hair, so designers often come up with a flash of color to grab the eye and contrast the diamonds. Art deco was especially good at allowing separation of color, so as not to let the earrings become a jumble of confusing color, and a single highlight was usually all that was needed. Probably the biggest influence on jewelry design from the end of the art deco period was Hollywood. Leading ladies became superstars, and what they wore would create demand all over the world for similar dresses, shoes and jewelry. The end of the 1930’s was also, of course, the start of a period of extreme hardship for many people, and even those movers in society who had previously demonstrated their wealth enthusiastically were forced to look at less expensive opportunities to enhance their jewelry collections. Semi-precious stones increased in popularity, as did the use of other materials with fewer diamonds or rubies at the heart of earrings produced at the time. This, though, didn’t mean the designers weren’t still producing fabulous creations. Over time, fortunes improved and jewelers once again started to produce more opulent earrings in any manner of styles. The 1960s and 1970s were periods of great change across the world, and designers embraced the chance to move into new areas of manufacture. From reasonably subtle designs came huge demonstrations of style whose influences can still be seen today. Hoop earrings first emerged from the hippy culture of the 60s and marched straight through the 70s until the era of the punkette took off and suddenly we were back to studs and sharp edges. Whether your tastes are for drops, hoops, studs or any other style of earring, these often under-appreciated accessories have been a delight since the early days of jewelry, and deserve far more exposure.